Holy cow, that year flew by. 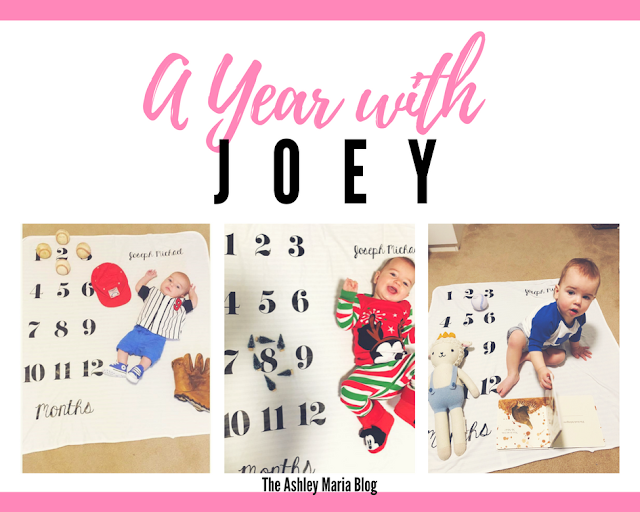 Just yesterday we were planning our baby shower, decorating the nursery and mentally trying to prepare ourselves for what a whirlwind our life was about to become. Now, a year later, I can't imagine what life was like before him. There have been so many ups and downs. Not everything has been easy (even though I like to pretend it has been!) The days a for sure long, especially when Joey fights his naps- which is like every day.. ha. But, once we falls asleep on my shoulder or chest, I want to hold him there forever. There is nothing like motherhood and you never really have it all together.. just when you think you are getting the hang of something you get the dreadful teething stage or the refusing to take a sippy cup or eat with a spoon. It's great though. I walk along the couch and while pushing my John Deer Tractor all around the house and outside. I climb the stairs (with my parents behind me) all by myself. I have 6 teeth (four on top and two on the bottom) and my hair is getting pretty long! I love bath time and playing peek a boo.